Fraudsters are awake again looking for who to play their tricks on. Are you a diamond bank user, you need to be careful now, safe guide your bank details very well. You may be aware of a recording of a phone conversation purportedly involving a fraudster trying to convince a bank customer to reveal her account details. This recording is indicative of the increasing sophistication of scammers and the need for customers to remain vigilant at all times. 1. A call from or email from Diamond Bank will address you by your full name (as captured in your account opening documents). 2. Always access Diamond Online only via their website at www.diamondbank.com and not through any other link (especially those sent via email). 3. Do not open suspicious texts, popup windows or emails. 4. Giving away one-time PINs (OTP) and token information is very risky and can be likened to giving your house keys, the key to your safe or even your Debit card and the PIN number to total strangers. You simply wouldn’t do these things and don’t do the same with your tokens and OTPs. 5. 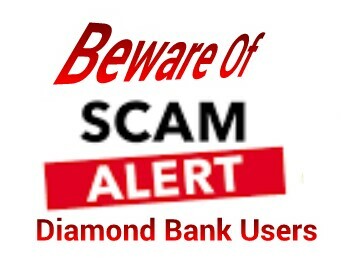 Diamond Bank protects its customers by sending OTPs only to their registered phone numbers and sends emails whenever an account is logged into from a device. The Diamond Mobile app cannot be registered on more than one device at the same time. 6. Diamond Mobile App is by far the safest way to transact, with less inherent risk than using online services on shared computers, cards at merchants you don’t know and certainly lower than the risk of having your signature forged on a cheque. 7. Diamond Bank’s Enterprise Fraud Management software runs complex scanning of customer transactions to pick up on any suspicious trends and eliminate fraud at the source. 8. If you are ever in doubt over the authenticity of a call or email claiming to be from Diamond Bank, hang up the call immediately and seek assistance from our 24 x 7 contact centre where the agents will be able to help you in a safe and fully authenticated manner. To report such scams or for more information, please kindly visit any of Diamond branch near where you are residing. Share this post to families and friends so that they cannot fall victim for scammers.